Now talking about Madrid, the first thing that came to my mind is its football (soccer) team and of course many of my Spanish friends are from this city. I have not really researched on this city before I came as it was more of a “stopover” destination. Well I am pleasantly surprised that this city has so much more to offer than what the ignorant me has thought. Below is what I managed to cover in one full day and I surely need to go back again! The Parque del Retiro is Madrid’s main park with the famous Crystal Palace (completely made out of glass) is a beautiful place to stroll around. From there, you can walk to Calle de Alcalá and the Alcalá Gate, the stunning Plaza de Cibeles and Puerta del Sol, the city’s best-known square. Plaza Mayor is another famous site. This plaza once used to have bullfights, tournaments, markets and even (scary) executions! Another must see is the Royal palace. Though it’s the official residence of the royal family, they don’t live here and it is only used for state functions. Across from the palace is Madrid Cathedral where official state ceremonies are held. Though this may not be the nicest cathedral in terms of look, it is one of the nicest place to view Madrid’s skyline. For those bullfighting lovers, make sure you visit the Plaza de Toros which is the home of bullfighting in Spain and arguably the world. The building is beautiful so even if you can’t get tickets to the show, it is worth a visit to see the building. If you have the time, Casa del Campo park which has an amusement park and zoo and the Parque del Oeste where an Egyptian temple (the Temple of Debod) can be found are interesting places to visit. Too bad time does not permit me to visit these places. Next time! ⁃	Travelling to/from the airport: There are four modes of transport – Metro, train, bus or taxi – each takes around 30–40 minutes with taxi being the fastest (and most expensive). You can ask the information counter at the airport on which mode of transport is most convenient for you to reach your hotel. If you have 4 people, the taxi may add up to a very reasonable cost for each and save you the hassle. ⁃	Central Madrid is very walkable but please wear comfortable shoes as you will be walking a lot. If you find it too tiring or is travelling a little further, the metro is a cheap, convenient and fast way to navigate around the city. They sell single tickets, a set of 10 tickets (which is cheaper) and tourist pass. Map out your route to determine how many times you are going to take the metro and you can do your sums on what works best. ⁃	If you are in Madrid on a Sunday, head to the El Rastro flea market along the streets between Plaza Mayor and Puerta de Toledo. – Barcelona and Seville are good extensions to your Madrid trip which I have separately blog. – Do try the local speciality of Chocolate Con Churros. This is essentially long churros served with a big cup of melted chocolate which spells YUMMY! – I am a paella and Sangria fan so Spain is a food heaven to me. The second photo is taken from the restaurant opposite the Central train station (just beside McDonalds) but I can’t remember which restaurant I had fo the first photo. Anyway I must say most of the restaurants that I stepped into are pretty good. Well it is Spain after all! I am so glad I made this detour. Barcelona lives up to my expectation indeed. It has just so much to offer and as someone puts it, “the city has not just one but many different worlds to explore”. I enjoyed the nice walk up the famous avenue Las Ramblas starting from the Columbia statute on one end (near the port) all the way to Plaza de Catalunya on the other. 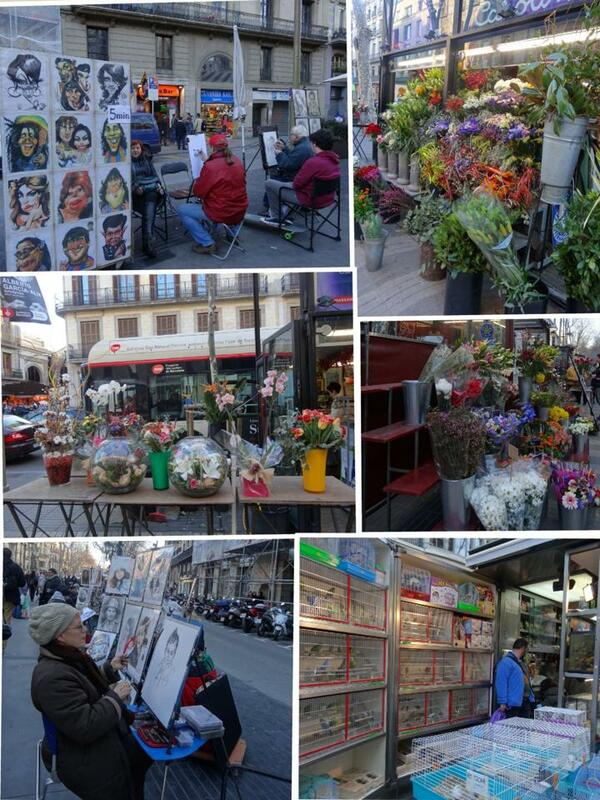 The nice street throbbed with vitality (especially on Saturdays), with artists drawing things like self-potraits, human statues, jugglers, singers, flower stalls, caged small animals and so on can be found along Las Rambas. The famous Cathedral is just mid-way along Las Rambles and many other nice shops, cafes, departmental stores and hotels lined the avenue. I would say Las Rambles is one of my 2 favourite avenues amongst the different cities that I have visited so far to stroll up and down (the other being the Strip in Vegas minus the heat of course lol). The old Gothic Quarter with its famous narrow alleys and well preserved monuments is also another nice area within the city centre to roam around. 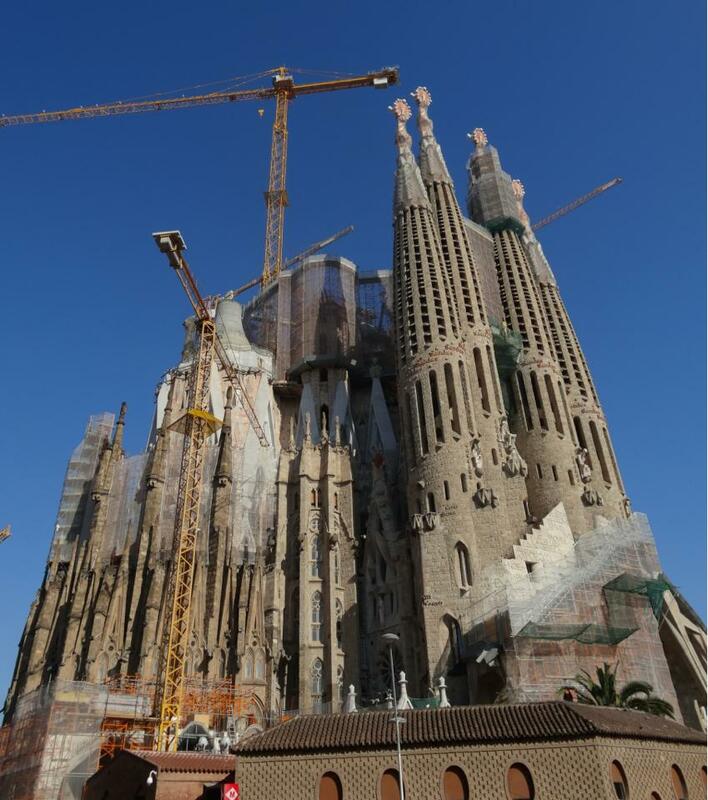 A visit to the famous unfinished cathedral (Sagrada Família) is a must. 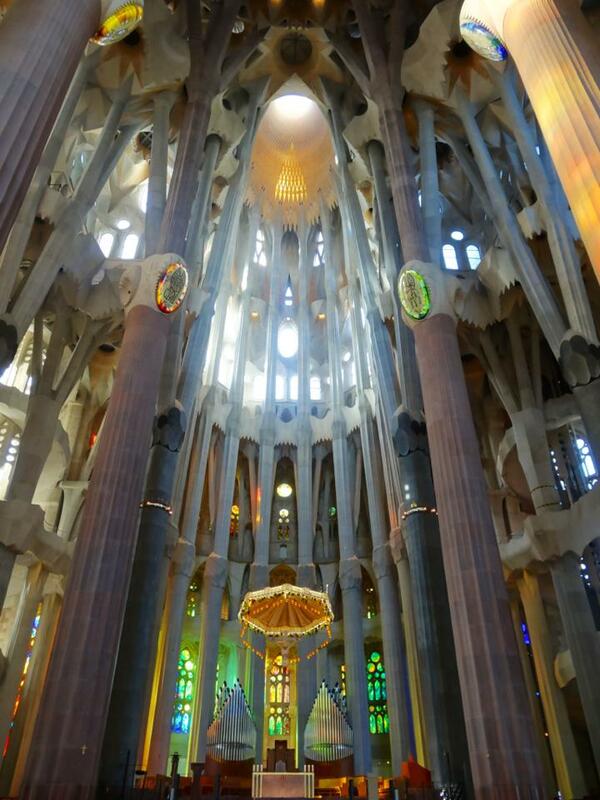 This cathedral is one of the most impressive work of the hermit-like architect Antoni Gaudi (who interestingly was killed by a tram), with stories of Christ (eg cruxification) being portrayed on each side of the Cathedral. You can take a ride up to the top of one of the towers and enjoy the fine view. I was pretty lucky that the queue to enter the cathedral was pretty short when I visited and hence decided to see the beautiful interiors of the cathedral as well. 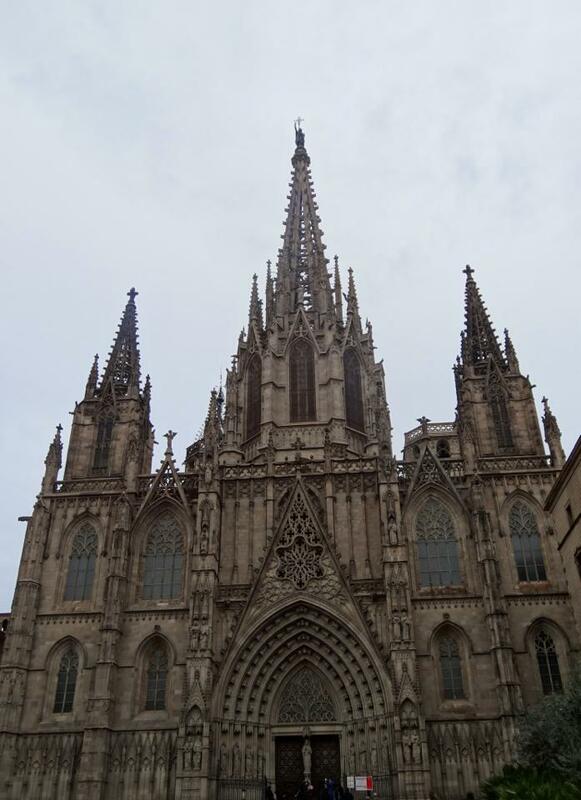 I would say that if I get to visit Barcelona again, I would still join the queue to see the interior of this awesome cathedral again and would highly recommend anyone visiting Barcelona to plan this into their itinerary. Another of Gaudi’s work, Parc Güell, is a beautiful fairy-tale liked park located high up in the city. I love the way the park was designed – with Hansel-and-Gretel houses at the entrance, interesting mosaic serpent, and the Banc de Trencadís (a multi-colored ceramic bench) which curves around a spacious esplanade. I felt like I was entering a magical wonderland the moment I stepped into the park. If you climb up the park, you will get one of the most beautiful scenic views of the city. Of course, being a Gaudi fan, I also visited other of his masterpieces such as Casa Batllo and Casa Mila and felt fully satisfied after my “Gaudi indulgence”. After all the “artistic immersion”, I made my way to the Olympic complex and then up the Montjuic hill for panoramic views of the city and port. Of course, not to forget, Barcelona is one of the rare cities in Europe where you have a beach in the city itself. When the temperature is much warmer (typically from end April to mid October), many locals and tourists flock to this wonderful city for its beach and warm sunshine. Oh, one thing that I love so much about this city is that there are still things to do at night. 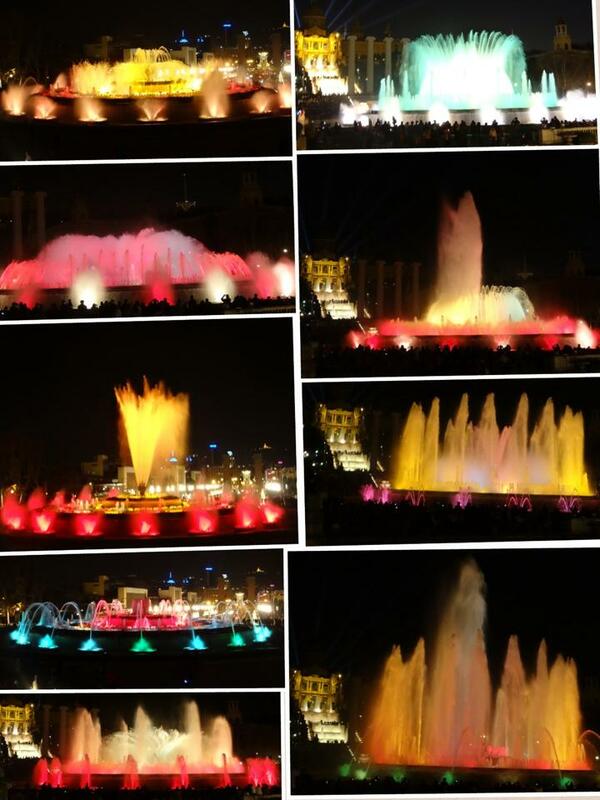 When night falls, make sure you head to the “Magic Fountain” (Font Màgica) located in front of Palau Nacional for a magical (and free) fountain show. I have seen many fountain shows at different cities/countries and I would say that only the famous fountain show at Bellagio in Vegas can triumph over this (ok before I get “shot”, let me caveat that this is a personal opinion lol). 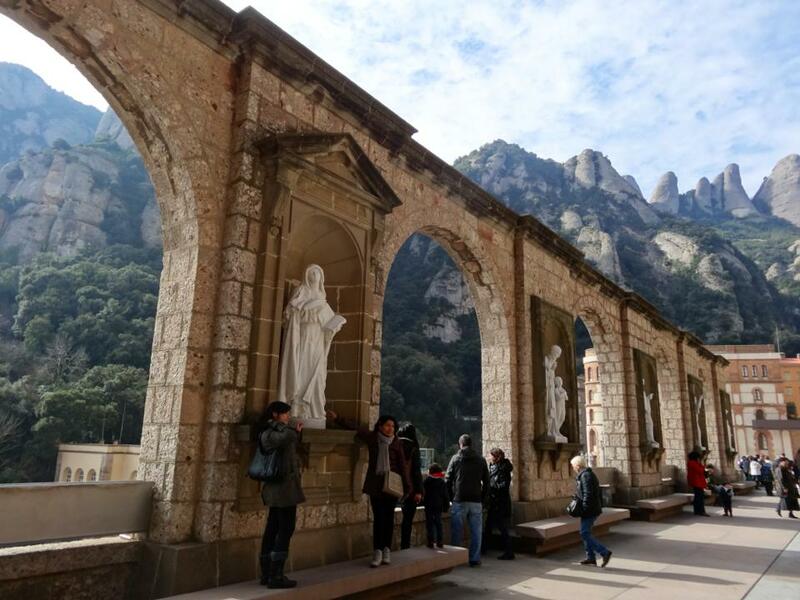 Just an hour by train from Barcelona is Montserrat. A cable car ride will take you up the hill to the monastery (alternative is to drive up). Every year, many pilgrims come here to see the “Black Madonna”, which is a 12th-century Romanesque carving of the Black Virgin, with long queue forming up to see the statute. It is believed that by touching the ball held by the Black Madonna, you will be cured of your illness and whatever your wish will come true. Even if you are not a Catholic, the monastery is a great tourist attraction as it is nestled high up in the mountains with beautiful landscape and architecture. The Black Madonna is just so famous that regardless of your belief, it is really amazing to be able to come up close to her. Everyday before noon time (except for Saturdays), the boys choir will sing in the mass. Even though I am not a Catholic, I was captivated by their awesome voices and would highly recommend that you plan your trip so that you will be able to hear the choir sing. 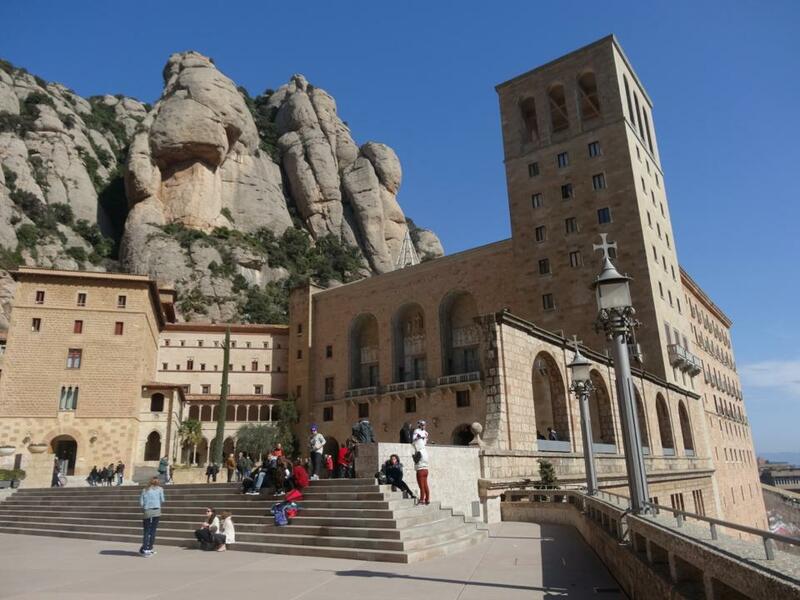 Apart from the monastery, there are a couple of cog-wheel trains that can take you and the one that will bring you to the top of the mountain is the “Sant Joan Funicular”. If you have the time, do take this funicular as the hilltop will give you great view of the monastery below and the beautiful mountain range. 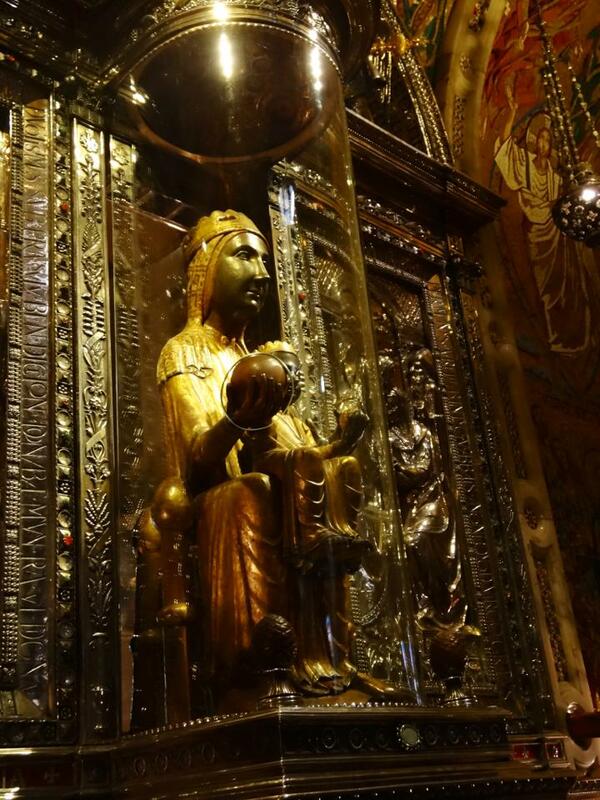 – To avoid the long queue to see the Black Madonna up close (where you will be able to touch her), step out of the sanctuary a few minutes before the mass ends and wait outside the right door to the sanctuary. There is a sign to say that this is the place to queue so just queue there. Once the mass ends, the door will be opened and you will be lead right through the walkway to the end of the sanctuary where the Black Madonna is. – Overall, Barcelona is pretty safe but do exercise the general traveller caution and beware of pickpockets especially at crowded areas. – For Picasso fan, the Picasso Museum is something that should not be missed. – Take note that the timing of the Magic Fountain shows varies depending on the time of the year (but typically operates from Friday to Sunday, and during the summer months there are shows on Thursday as well). You may want to check with the hotel or information counter on the specific timing. The place is easily reached by the Metro (take to Plaça Espanya on either the Green or Red Line). – To travel between the airport and the city, there is a shuttle service (called Aerobus) that takes you to Plaza de Catalunya, with stops in between. For details of the stops and timetable of the bus, you can visit http://www.aerobusbcn.com/index.php/en.html. – All parts of the city are pretty much accessible via Metro. Don’t be intimidated by the metro system which looks complicated but is in fact pretty simple. The rule of thumb is to identify which station you are at, which station you want to go to, the train lines (including transfer that will take you to your destination station), and then board the train heading towards the last station along the train line (same thing when you need to transfer to different lines). 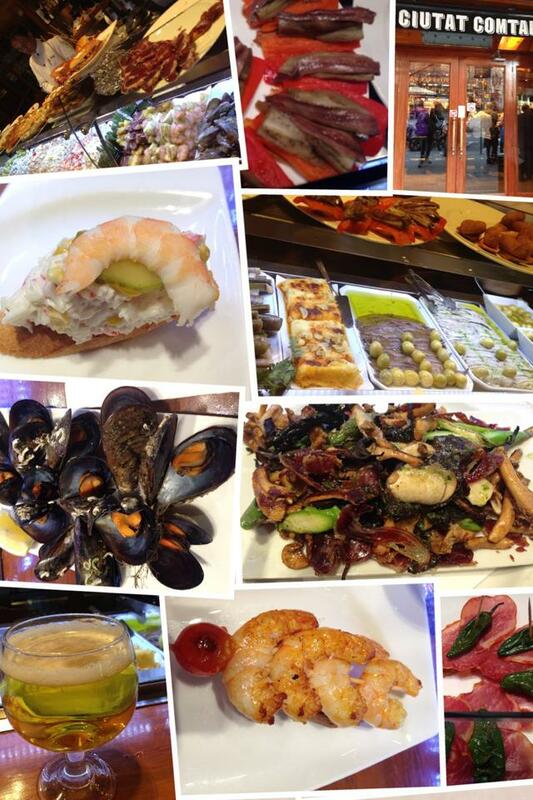 – There’s another tapas place that I have tried out called “Lonja de Tapas” at Pla Palau, 7 which is near to the Picasso Museum. It’s also pretty good (or is it that I just love Spanish food) and the presentation was cool. The price is pretty acceptable, not expensive but not cheap either. – Another must-try Spanish dish for many tourists is paella. A nice one to try out is “7 Portes” at Pg. Isabel II, 14. This place opens at 1pm till 1am and is an old-fashioned restaurant that locals have been frequenting for over 100 years. You can check out their website www.7portes.com to read about their history and see their menu. – Things in Spain are generally much cheaper than the rest of western/central Europe. You will get most of the different labels lined up along the La Rambas and Plaza de Catalunya area. So be forewarn – you can literally shop till you drop in Barcelona. – The popular “must-buys” in Spain are labels such as Zara and Mango, to the high end designer products such as Loewe, which you can find them all along La Rambas or Plaza de Catalunya. – I would highly recommend that one stay along La Rambas and Plaza de Catalunya are as it is centrally located and easy to navigate around from there. Remember that the airport shuttle stops at Plaza de Catalunya so if you stay there or within walking distance from there, it will be really convenient as you will not need to lug your luggage too far. – I stayed at Hotel 1898 located at La Rambla, 109 which is just a short walk from Plaza de Catalunya. It is a 4 star hotel with great location (along La Rambas) and the rooms are comfortable and clean. The price is also pretty good. After much research, I have shortlisted 3 hotels namely Le Meredian, Royal Ramblas and this. The reviews on tripadvisor of this hotel is much better than the other 2 and cheaper than Le Meredian so I decided to give this a try. Gosh, I was glad that I found this gem! No wonder the tripadvisor review of this hotel is outstanding.